According to our specialists, Asn1 Ransomware might encrypt all data on user’s computer, except the files belonging to the operating system or other programs. As much as you may want to restore the enciphered data, we would not advise you to pay the ransom. 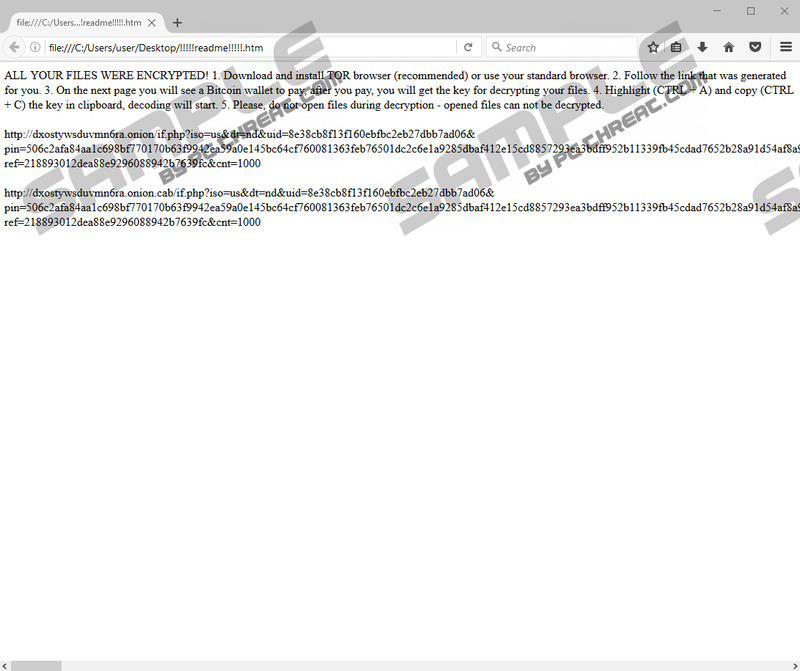 Currently, it looks like the malware’s website that should deliver the decryption tools does not seem to be working properly, so even if you decide to pay the requested money, you might not get the decryptor. Nonetheless, if you are prepared for such situations and have some copies of at least the most important files, there is no point in funding the malware’s creators. In this case, we would recommend removing the malicious program immediately and to assist you in this task we are adding deletion instructions at the end of the text. 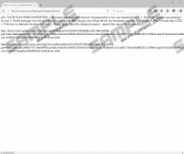 The Asn1 Ransomware’s victims report that the malware is spread with suspicious emails. For example, it could be a letter claiming that the attached file is a document containing sensitive information meant to be seen only by you. However, the attached text document could contain encrypted message, and if users interact with it, they may accidentally infect the computer. The next time you receive such an email, you should think twice before opening it. No matter how curious you feel, firstly ask yourself if the satisfaction of seeing what is in the file is worth, for example, losing all photographs, videos, and other valuable data on the computer. In case, you believe it could be an important file you were waiting for, at least try to scan it with an antimalware tool first. Also, if you do not have an antimalware tool yet, it might be a good idea to acquire one to protect the system from malware such as Asn1 Ransomware or other potential threats in the future. Users who do not suspect that the file they opened might have been infected with malware, may not understand what is happening and by the time they realize it, the damage might be already done. After launching the malicious file, the threat should create an executable file with a random title in the %APPDATA% location. Then it should also go to HKEY_LOCAL_MACHINE\SOFTWARE\WOW6432Node\Microsoft\Windows\CurrentVersion\Run directory and create a Registry entry to make the system launch the malicious application after each restart. Lastly, Asn1 Ransomware should do its main task which is to encrypt your data and make it unusable. When the encryption process is over the malware might place ransom notes on your Desktop or other directories. Additionally, the threat should put a window on top of your screen. It contains short instructions on how to pay the ransom and get the decryption tool. As for the provided buttons, clicking them should lead you to a website with further instructions. For instance, our researchers clicked one of the buttons, and the site that was loaded instructed them to pay 1 Bitcoin (approximately 760 US dollars) in the next five days because the sum could be increased up to 2 Bitcoins. Since the website does not seem to be working properly, it is most likely impossible to get the decryptor. Thus, we would advise you not to waste any time with this threat and eliminate it at once. Experienced users could try to get rid of Asn1 Ransomware manually while following the deletion steps placed below this text. They will show you where to find the infection’s created malicious data and how to erase it too. Still, if it looks rather too difficult, there is another way to deal with this malicious program. What we have in mind is you could install a trustworthy antimalware tool, perform a full system scan and wait till it detects Asn1 Ransomware automatically. Once the report shows up, you could simply click the removal button and the malware should be erased. In case there are other threats on the system, the tool would locate and delete them at the same time. If you have other questions about the malicious program, just leave us a comment at the end of this page or write a message via social media. Press Win+R, type regedit and select OK.
Find a suspicious value name with a random title, e.g. 2289697a.exe, then right-click it and press Delete. Locate an executable file with the same random name, e.g. 2289697a.exe, right-click it and choose Delete. Quick & tested solution for Asn1 Ransomware removal.